Innovative system solutions for more efficient processes and a greater competitive advantage are the focus of the ENGEL trade fair booth at Chinaplas 2013 from 20th to 23rd May in Guangzhou. Live on show: the new all-electric ENGEL e-mac injection moulding machine, once again demonstrating its capability in the manufacturing of electronic mass products. During the four days of the fair, an ENGEL e-mac 50/50 will be producing holders for semiconductor chips made of polyetherimide, an application that poses an extremely tough challenge in terms of the injection moulding machine’s precision. The holders measure 26 by 23 mm, but the critical factor above all others is the very thin wall thickness of just 0.65 mm and the mesh structure to be created with an inner edge length of 0.42 mm. Despite these exacting requirements and the hard-to-handle raw material, the ENGEL e-mac achieves a cycle time of just 19 seconds in this application. With an acceleration of over 20 m/s², the injection axis of the ENGEL e-mac is now the world’s fastest of its kind. Additionally, the synchronous movements of the drive axes ensure fast cycle times. Thanks to its extremely compact footprint, the ENGEL e-mac saves shop floor space. Additionally, it is very frugal in its use of resources. From injecting and metering to mould and ejector movements, all drives in the ENGEL e-mac are servo-electric. They are operated by a modern axis system solution involving a stabilised intermediate circuit. The braking energy is recovered and fed back into the grid. The ENGEL e-mac series has four machine sizes with clamping forces of 50, 75, 100 and 180 tonnes. Equipped with the proven CC 200 control unit, the ENGEL e-mac offers complete modularity and automation technology integration capability. The new machine series sees ENGEL reinforce its position as an all-round talent in the field of all-electric injection moulding technology. While the tried-and-trusted ENGEL e-motion machines have established themselves in medical technology and in fast running applications in the packaging industry, the ENGEL e-mac is an extremely economical alternative for applications in technical moulding and the electronics industry. 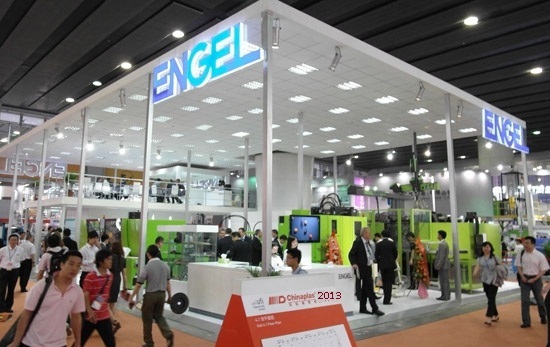 An ENGEL e-motion 440/160 T plays the leading role in the ENGEL packaging exhibition area at Chinaplas 2013. The all-electric injection moulding machine will be producing thin-wall technology margarine tubs in a 2-cavity mould. Thanks to integrated in-mould labelling, the unit costs are very low. Ready-to-fill food packaging with high quality decorations is manufactured in a single step. The project partner for IML Automation is Campetella from Montecassiano, Italy. “All-electric ENGEL e-motion injection moulding machines are increasingly being deployed in high-performance applications in the packaging industry”, says Willmeroth. “The consistent ongoing development of this model series is what makes this possible.” The latest generation of ENGEL e motion injection moulding machines achieves cycle times of well under 3 seconds and injection speeds of more than 500 mm per second, a performance class that was long the domain of hydraulic accu machines. “Thanks to all-electric drive technology, we can now combine maximum performance with maximum energy efficiency”, says Willmeroth. ENGEL is demonstrating what this can look like in practical terms with the production of a centre console in a highly-integrated and automated production cell on an ENGEL duo 2050/350 pico injection moulding machine – equipped with ecodrive servohydraulics and a swivel plate. While a preformed capacitive foil is back injected with PC/ABS on one side of the mould, the basic component is coated with polyurethane on the other to protect the surface and give it a premium appearance. Two ENGEL viper 20 and ENGEL viper 40 type linear robots will take care of the component and part handling. Starting with capacitive foils and plastic pellets, ready-for-use controls for the vehicle interior are thus produced in a single step, while legacy methods would involve individually injecting and then assembling several different components. The technology, which ENGEL is marketing under the name of Sensitive Surface in cooperation with its system partners, is based, among other things, on the ENGEL clearmelt process, and the touchskin technology by plastic electronic in Linz/Austria. Other partners involved in this project are Hennecke in Sankt Augustin/Germany (polyurethane processing), Schöfer in Schwertberg/Austria (mould making) and Magna Exterior & Interior Systems in Munich/Germany (application). But it’s not just in the automotive industry that Sensitive Surface Technology will revolutionise the design of the controls on electronic systems and devices. Enquiries have also been received from the household appliances and medical technology industries. To accommodate the production cell perfectly to match the product, volume and materials, ENGEL draws on its wide spectrum of hydraulic, hybrid and all-electric injection moulding machines, as well as injection units, feeders and metering pumps specially developed for elastomer processing. In many cases, tie-bar-less ENGEL victory injection moulding machines offer benefits in LSR applications. Compared to other model series with tie-bars, the excellent plate stiffness ensures superior mould support, thus reducing burr formation and improving the product quality. The ENGEL victory machine on show at Chinaplas uses cold runner technology. The 8-cavity mould was provided by ENGEL partner Elmet. The ENGEL victory 110 tech injection moulding machine was built at the ENGEL production facility for small to medium sized machines in South Korea, which will be starting up production at its massively expanded production hall shortly before Chinaplas 2013 opens up to the public. The production capacity has been almost doubled from 650 to more than 1100 machines per year. It was just last year that ENGEL also substantially extended its large-scale machine plant in Shanghai. Both investments help to do justice to growth on domestic markets and increasing demand from South-East Asia. “Thanks to decentralised production in Asia, we can assure our customers of short lead times and the accommodation of the injection moulding machines and turnkey solutions to the specific requirements on site”, says Gero Willmeroth.